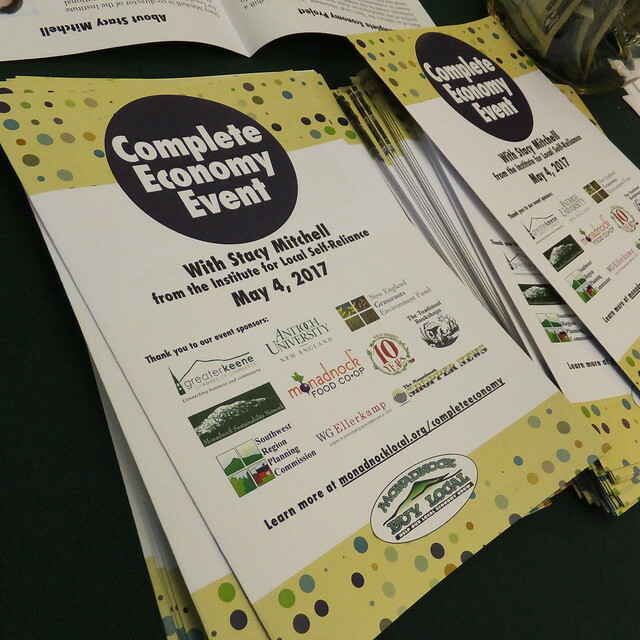 The Complete Economy Project supports the adoption of policies that level the playing field for locally owned businesses in our region and spark business models that contribute to our local living economy. This project includes an innovative effort to re-frame local economy policy work into a movement in our region and beyond. With the success of “Complete Streets” in our region, we hope to adapt this framework into a “Complete Economy” movement. Complete Streets, an evidence-based program of Smart Growth America, advocates for policies and practices that ensure streets are safe for people of all ages and abilities. Inspired by this mission, the Complete Economy Project cultivates a regional economy that works for all people and balances the needs of diverse business types. "What we really need to do is change the underlying policies that shape our economy," states Stacy Mitchell, co-director of the Institute for Local Self-Reliance. "We can't do that through the sum of our individual behavior in the marketplace. We can only do it by exercising our collective power as citizens." In late August 2016, we met with Smart Growth America to discuss the feasibility of adapting the Complete Streets Movement into a Complete Economy Movement. Their leadership team supports this idea and wants to stay connected to us as we develop this project. In Winter 2017, we identified and hope to recruit these partners to help us spearhead this project. Contact us if you'd like to learn more. In early Spring 2017, we identified specific needs and opportunities in our community, balancing low hanging fruit work with policy that results in the greatest positive impacts (Resources: Policy Change for Local Living Economies and Climate Appropriate Economy Policies). In May 2017, we brought Stacy Mitchell from the Institute of Local Self Reliance to our community to educate and galvanize our community and board around this work. In Summer 2017, we will review case studies, develop and implement our first policy to advocate for. If our project is successful, the City of Keene will adopt its first of many policies supporting our local living economy. We also want to share this model with other communities. Funding for the Complete Economy Project was provided by the New England Grassroots Environment Fund. The New England Grassroots Environment Fund energizes and nurtures long-term civic engagement in local initiatives that create and maintain healthy, just, safe and sustainable communities using stories, tools and dollars to fuel local activism and social change. Since 1996, the Grassroots Fund’s core grantmaking program continues to fund nearly 150 grants annually, giving more than $4 million in 20 years to initiatives by better than 1,700 community groups covering more than 60 percent of New England’s cities and towns. New England Grassroots Environment Fund awards help solve the problems and realize the promises in addressing climate change and energy action, local food, environmental health and justice, land and water and local economies. For more information, please visit grassrootsfund.org or call 603-905-9915.